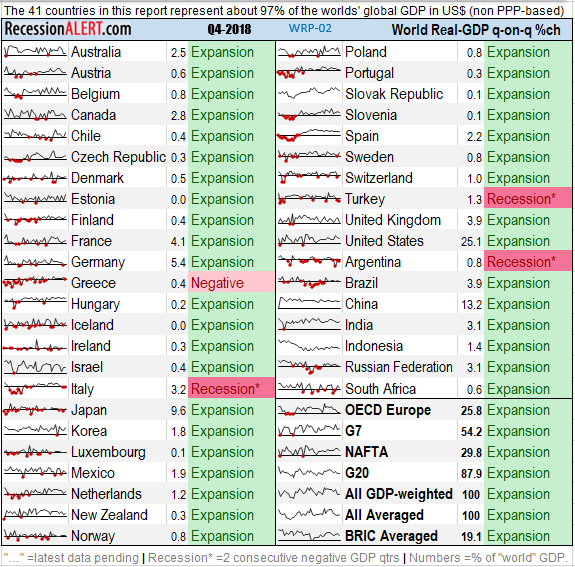 NOTE : The following charts are extracts from our monthly Global Economy Report available with a standard subscription. 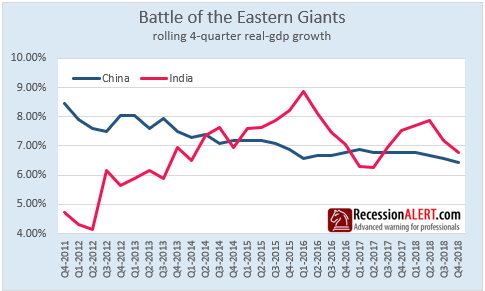 China has been steadily declining, whilst despite recent weakness from Q2-2016 for India, her trend is still up. 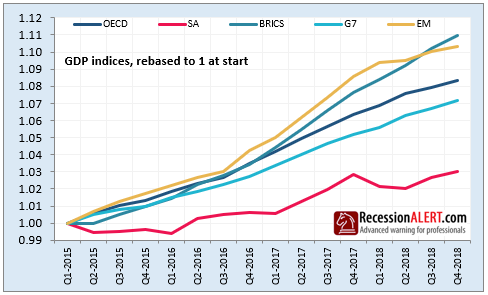 Looking at the major GDP-weighted trading blocs is also interesting with BRICs and EM naturally at the top of the pile and G7 below the OECD average since Q1-2015. Of note is how South Africa, a member of both BRICs and EM, is a perennial under-performer of these two trading Blocs. Here is a look at the quarter-on-quarter GDP growths. Canada, Germany, Portugal, U.K and Russia are all flirting with a potential negative Q1-2019 print given their current trends. Also of interest is how the whole of Europe (representing 25.8% of global GDP) is flirting with stagnant GDP growth and a possible negative GDP print for Q1-2019. Apart from Argentina we see that economic powerhouse Italy with roughly 3,2% of global GDP is in technical recession as well as Turkey. The prognosis is that we should expect things to get worse before they start getting any better on the global stage. In light of the (rare) warning we issued a while back regarding U.S stock market valuations, it is our opinion that it would be prudent for U.S investors to err on the side of caution for now, despite what any US stock market rallies dish up to the contrary. 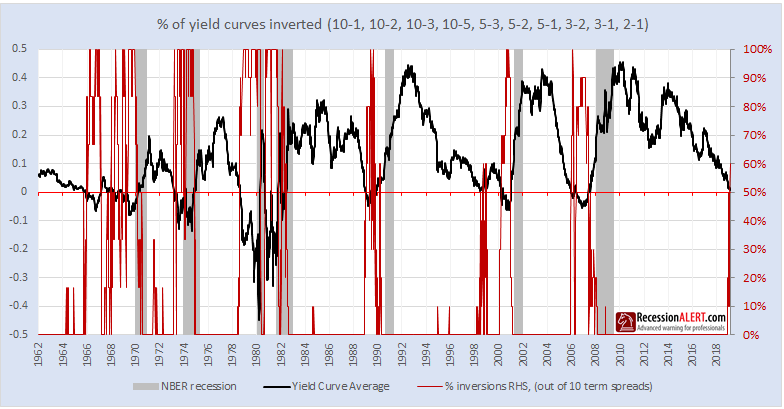 Note that once the yield-curve complex starts inverting, it rarely un-inverts itself. 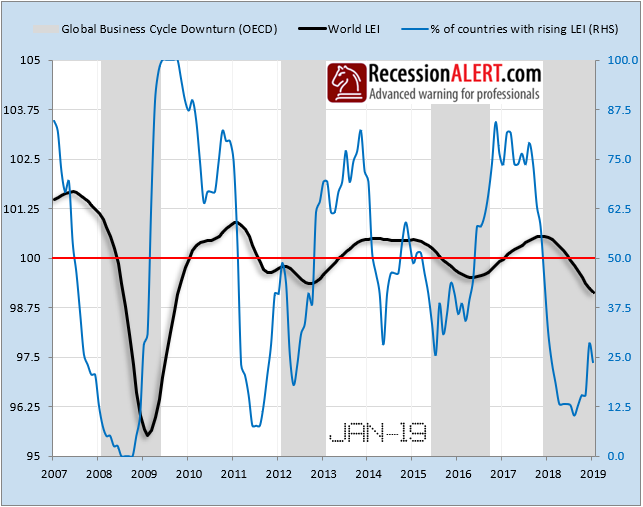 Despite this stark warning, remember that it is a single long-leading indicator with significant variances in lead times to historical recession which makes it far less useful to the market-timer than meets the eye. NOTE : The above charts are extracts from our monthly Global Economy Report available with a standard subscription.